Ivan Toney claimed his first Peterborough United goal to pinch a 3-2 victory at Southend today (September 8). Posh looked likely to rue letting a 2-0 lead slip as the home side fought back impressively after the break, but substitute Toney popped up two minutes from time to keep his side unbeaten and top of League One. Matt Godden had scored twice from set-pieces to give Posh a 2-0 lead before Tom Hopper and Stephen McLaughlin both scored in 12 second-half minutes to drag Southend level. 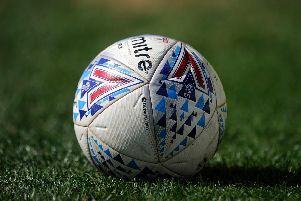 Posh did make their first change to a starting line-up in a League One game this season with Jamie Walker replacing Joe Ward, but the Scot found it tough to get into a first-half dominated by the home side. Simon Cox had a chance to open the scoring for Southend in the opening minutes, but Colin Daniel’s block took the pace off the shot and Aaron Chapman saved easily. Jason Cummings then sidefooted wide following a Godden cross, but Posh didn’t threaten again until Siriki Dembele’s skill won a free kick in a wideish position in the 33rd minute. Dembele took it and found Cummings in space in the penalty area. He chested the ball down for strike partner Godden whose sidefoot somehow found its way past debutant goalkeeper David Stockdale. Cox missed a glorious chance to equalise almost immediately when failing to get any power into his shot from eight yards and Chapman then had to react smartly to beat away a fierce drive from Timothee Dieng. Dieng’s header was pushed over the bar by Chapman in first half added time. Chapman had started a decent personal half by chipping the ball over a Southend striker before volleying clear, a rare moment of skill from a Posh player in the opening 45 minutes. Before the Posh goal Southend right-back Elvis Bwomono escaped into the penalty area, but Ryan Tafazolli was on hand to clear the danger. Posh opened the second-half brightly with Walker striking the top of the crossbar direct from a 30-yard free kick. Walker was cautioned soon afterwards and then substituted for Marcus Maddison who had a immediate impact on proceedings. Maddison was fouled 40 yards from goal, clipped the free kick into the area where Tafazolli directed it, probably accidentally, into the path of Godden who finished easily on 56 minutes. Posh looked comfortable, but out of nowhere a huge kick by Stockdale was allowed to travel too far. Cox beat Bennett by the touchline, fed Harry Bunn whose cross was tapped in from close range by Tom Hopper. And that goal galvanised Southend. First Cox shot over when well placed and then Chapman had to stop a fierce Bunn shot. Southend continued to swarm all over Posh and the equaliser they deserved arrived with 14 minutes go. Cox was again involved in the build-up, freeing Ben Coker who had left Maddison for dead down the left and his cross was finished first time by Stephen McLaughlin. Posh rallied and substitutes Ivan Toney and Maddison combined before the latter’s shot was deflected onto the crossbar by John White. Toney then curled a free kick wide from the edge of the area before he snatched his winning goal. Another substitute Ward made a superb run and was found splendidly by Mark O’Hara. Ward’s shot was parried by Stockdale, but Toney was on hand to gleefully seal a first Posh win at this venue since 1999. Posh: Aaron Chapman, Jason Naismith, Colin Daniel, Rhys Bennett, Ryan Tafazolli, Alex Woodyard, Mark O’Hara, Jamie Walker (sub Marcus Maddison, 55 mins), Siriki Dembele (sub Joe Ward, 77 mins), Matt Godden, Jason Cummings (sub Ivan Toney, 70 mins). Unused substitutes: Mark Tyler, George Cooper, Josh Yorwerth, Louis Reed. Southend: David Stockdale, Elvis Bwomono, Ben Coker, John White, Michael Turner, Sam Manton, Timothee Dieng, Harry Bunn, Stephen McLaughlin (sub Shawn McCoulsky, 89 mins), Simon Cox (sub Theo Robinson, 84 mins), Tom Hopper. Unused substitutes: Nathan Bishop, Taylor Moore, Michael Klass, Stephen Hendrie, Renei Batlokwa. Goals: Posh - Godden (33 mins & 56 mins), Toney (88 mins). Southend - Hopper (64 mins), McLaughlin (76 mins). Cautions: Posh - Walker (foul). Alan Swann is at the game for the Peterborough Telegraph so check back for match reaction.